Nobody will ever wonder if I'm on my cell phone. Dammit..
Nobody will ever wonder if I’m on my cell phone. Dammit..
Are you tired of all of those little blue flashing lights on headsets hanging on the ears of everyone you try to talk with? Are you tired of wondering if they are suffering from schizophrenia or on the phone? No more mucking about. When I’m on the phone in my car or in a meeting, you’re going to damn well know it. 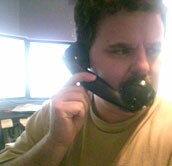 Pictured… my new bluetooth handset connected to my cell phone. No kidding. It stops meetings cold when I pull it out. Great fun.